This is an all-colour pictorial of James J. Hill's Great Northern Railway. Formed from a pair of bankrupt startup Minnesota railroads in 1878, Hill and his partners went on to acquire and build, with private money, what would become a railroad empire. 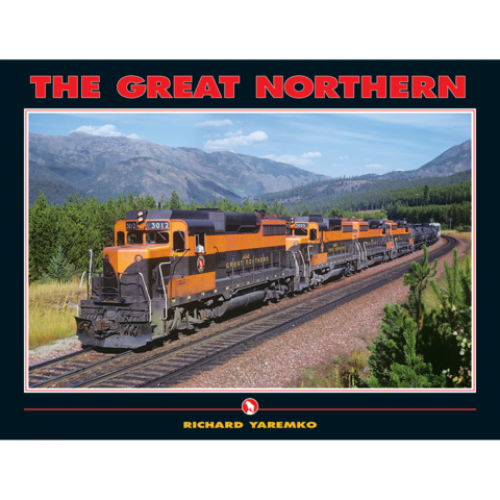 First as the St. Paul, Minneapolis & Manitoba then, after reorganization, renamed the Great Northern Railway in 1890. Hill's investors would never have to contend with another financial failure. Hill's railroad construction enterprise expanded beyond Minnesota to connect the Duluth-Superior Lakehead to the west coast at Everett, Washington, followed by a north-south link connecting Vancouver, British Columbia, with Seattle, Portland, and California. His business plan of using branch lines and feeder systems routing traffic to his Great Northern Railway from the Great Lakes, Canada, Europe, and Asia would serve his transportation enterprise well. During economic downturns, the Hill interests acquired the Northern Pacific Railway and the Chicago, Burlington & Quincy. In March 1970 all these corporate entities, along with the Spokane, Portland & Seattle Railway, were finally merged into the Burlington Northern Railroad. During the steam era, Great Northern operated big articulateds that moved iron ore from the Mesabi Iron Range to the Twin Ports and their famous Class O-8 Mikados could be found hustling fast freights across the Dakotas and Montana. The Great Northern also operated a 72-mile-long electrified district through Washington state's Cascade Mountains. With the arrival of the diesel era, the Great Northern owned and experimented with locomotives from nearly every builder. Taking the lead in the race for horsepower in the 1960s, GN ushered in the era of the SD45 with the purchase of number 400. Later named "Hustle Muscle," the historic locomotive was the first of its kind off the EMD assembly line. "Rocky," GN's trademarked mountain goat, was used to identify the Great Northern with Glacier National Park, Montana's vacation paradise. A pair of famous streamlined passenger trains named the Empire Builder and Western Star served Hill's grandiose hotels located in the park. All of this and more is presented here in 256 pages, illustrated by the work of many of the best colour railroad photographers of the steam-to-diesel transition era.